The world’s premier business school and accounting program accreditation body—the Association to Advance Collegiate Schools of Business (AACSB)—has formally recognized what accounting professors who are also working accountants have long valued: the significant and positive impact of their role in business and accounting education. 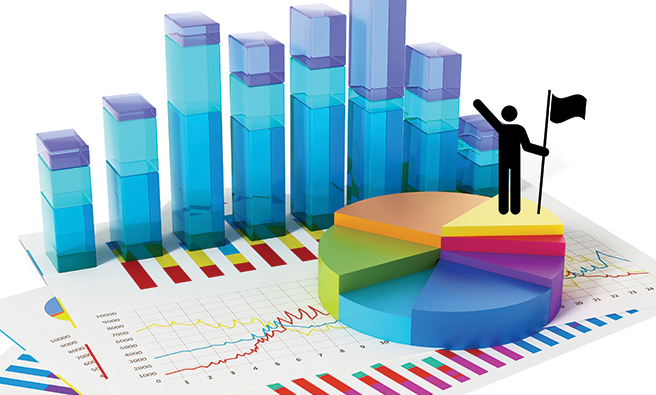 In a major revision to its standards, the AACSB allows for a greater percentage of faculty who are professionally qualified but don’t hold a Ph.D. degree to teach in university accounting and business programs. These changes to the accreditation standards—which were made in 2013 but aren’t widely known among practicing accountants—are good news for those of you who’ve worked in private practice or in a corporate setting for many years but have found it difficult to land a teaching position. But the revised standards are particularly significant to accounting departments and faculty because of the long-standing strong relationship they’ve had with accounting practices, the value that students and faculty place on certifications such as the CPA (Certified Public Accountant) and CMA® (Certified Management Accountant), and the need for practitioner expertise in a dynamic, expansive, and constantly changing field of study. 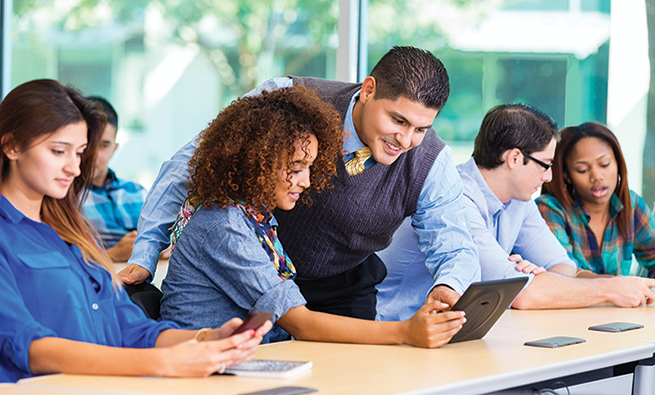 The benefits of the revised standards run two ways: Management accountants and other financial professionals will have an opportunity to discuss with students the practical applications of theoretical concepts using their real-world personal experiences, while students will appreciate the expertise and stories these practitioners have to offer. A staffing change—to a more balanced mix of academic and practitioner faculty—will have the effect of educating our business school and accounting students more broadly and better preparing them for the workplace. These changes will also open classroom doors to experts in practice and industry who want to give back to the profession and help prepare the next generation of accounting and business professionals. HOW HAVE THE STANDARDS CHANGED? There are three substantive changes in the revised AACSB standards that are of interest to accounting professionals. First, to recognize the contribution of working accountants to the classroom, the AACSB has incorporated the word “practitioner” in its faculty categories. The old set of AACSB standards from 2003 had two faculty classifications: Academically Qualified (AQ) and Professionally Qualified (PQ). 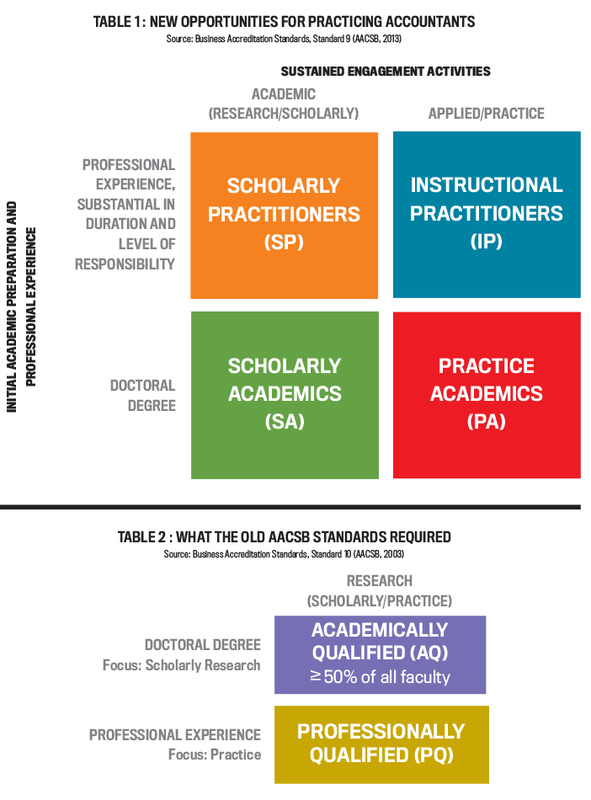 The updated set of AACSB standards has four faculty classifications: Scholarly Academics (SA) and three that focus on practice, which include Scholarly Practitioners (SP), Instructional Practitioners (IP), and Practice Academics (PA). These classifications are shown in Table 1. Second, a greater percentage of faculty who don’t hold a Ph.D. can now be “qualified faculty” under AACSB standards. The old set of standards required that at least 50% of the faculty be academically qualified; that is, they must have held a Ph.D. or Ph.D. equivalent (see Table 2). The revised set of standards (see Table 3) allows for up to 60% of the faculty to be practitioners (SP, IP, and PA). Of these three classifications, only PA faculty are required to hold a doctoral degree. 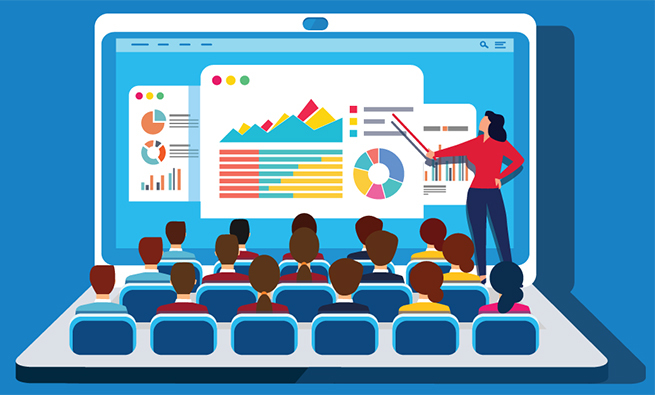 Participation in professional events that focus on the practice of business, such as presenting at a conference or teaching a CMA workshop for CPE credit. The beauty of this change is that it allows practitioners (SP, IP, and PA) to continue with their practice-related activities while maintaining AACSB-recognized faculty qualification standards. In an effort to better understand the updated AACSB standards, we developed and administered a survey of business school deans, accounting chairs, and accounting faculty across the globe. Our objective was to assess how these professionals perceived the potential impact of having more working practitioners in academia. We sent surveys to 10,472 active deans, chairs, and faculty members; 1,150 responded and were included in the study. The average age of respondents was 41, with an average tenure of 10 years, and almost two-thirds (64%) were male. While the majority of respondents were Caucasian, most other races were represented as well. Administrators (deans and chairs) made up 27% of respondents; the remaining 73% were faculty members. Respondents were given three scenarios and a question about each scenario. The scenarios and participants’ responses follow. 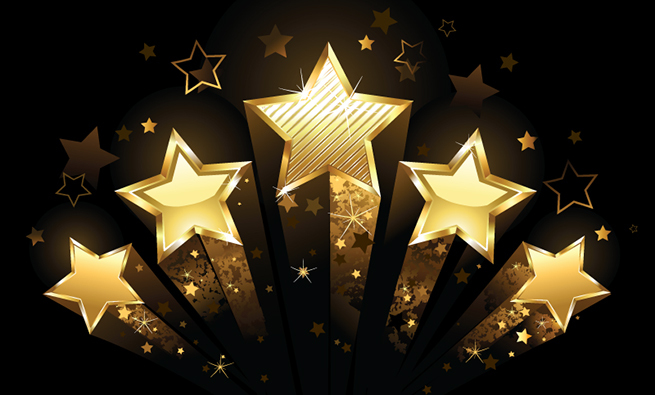 Question: Do you believe that practitioners’ contributions to Cliff’s and Julian’s accounting program will be more highly recognized and respected than before the updated AACSB standards? On a Likert scale of 1 (strongly disagree) to 5 (strongly agree), the mean response for all respondents was 3.15. That is, faculty and administrators (chairs and deans) overall perceived that Cliff’s and Julian’s academic institution would take a positive view of practitioners’ contributions in that they should broaden the education that students receive. Both the Pathways Commission, founded by the American Accounting Association (AAA) and the American Institute of CPAs (AICPA) to advance the future of accounting education, and the AACSB encourage bringing working practitioners into the classroom to integrate real-world experiences and perspectives in broadening students’ learning experiences. This would help bridge the gap between practice and education and, as mentioned earlier, better prepare students for the workplace. This change in AACSB standards allows department chairs to recognize contributions by Instructional Practitioners and Scholarly Practitioners while at the same time staffing their classrooms with lower-salaried professors vs. what Scholarly Academics typically earn. And not only do students enjoy learning from accountants and other financial professionals who have a wealth of real-world experience and interesting anecdotes, but the ability of these teachers to increase graduates’ value in the marketplace may make it easier for chairs to secure financial support for the professional development needs of IP and SP. Question: Do you believe that the change in AACSB standards for Jenna’s institution will increase the importance of practitioner-focused research? At many universities, research that’s published in practitioner-focused journals isn’t always perceived as positively as findings that are published in academic journals. For example, an article published in the Journal of Management Accounting Research is likely to be more highly regarded by academics than one published in, with all due respect, Strategic Finance. Respondents were asked whether they thought that the revised AACSB standards for faculty qualifications would change their perception about articles published in practitioner-focused journals. The mean response for all respondents was 3.05, indicating that they had a positive view overall. For example, publishing in practitioner-oriented journals like Strategic Finance could broaden the perspectives of academics who focus only on academic journals, allowing them to better understand the issues that practicing accountants face and how practitioners’ research may contribute to improving conditions in the real world. Both the Pathways Commission and the AACSB encourage the cross-fertilization of academic and practitioner research. This may help bridge the gap between practice and academic research topics and possibly produce more research outputs that will be helpful to practitioners. Scenario 3: Ruby is an accounting faculty member at a nondoctoral-granting research institution with AACSB accreditation. She has been at this university for more than 10 years and has been rewarded for writing practitioner-focused articles and columns. Yet during the last four years, her school has been hiring research faculty who publish in top-ranked academic journals at almost double the salary of other faculty who are publishing in practitioner-focused journals. 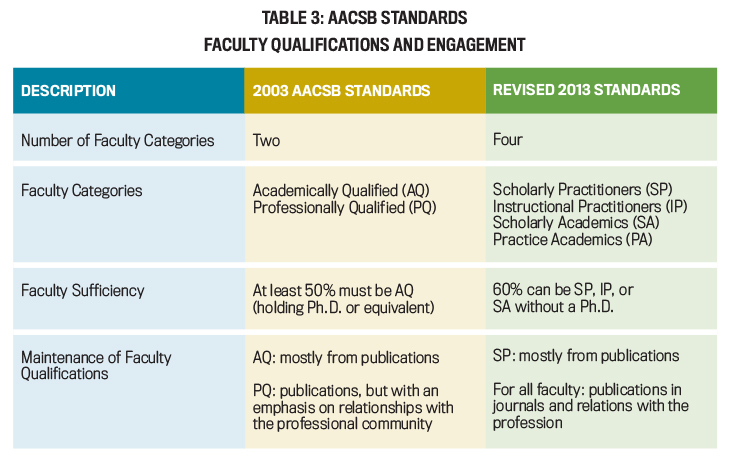 Now that the school has recently maintained its AACSB accreditation, the push for hiring high-cost scholarly academic faculty is diminishing. And with the updated AACSB standards requiring fewer scholarly academic faculty, the accounting program is replacing these expensive faculty with practitioner instructors. Question: Do you believe that the change in AACSB standards for this institution will enhance the recognition and reward of nontenure-track faculty? The mean response to this question was lukewarm, at 2.53 for all respondents. While chairs (mean response 2.32) were slightly more positive about the recognition and reward of nontenure-track faculty than deans (mean response 2.19), this type of recognition would require a significant cultural shift at universities. But with more full-time practitioner faculty becoming eligible to vote on faculty issues in the future, change is inevitable. Overall, the respondents agreed that the updated faculty classifications will enhance: (1) the perception of practitioners’ contributions to academic institutions and (2) the recognition and rewards for publishing in practitioner-focused journals. Our survey results show that faculty and administrators welcome the flexibility in the revised AACSB faculty qualification standards. Consequently, management accountants and other financial professionals will find that they’re supported and appreciated for the contributions they bring to business schools and accounting programs, including to the students, faculty, and prospective employers. Nevertheless, there remains a perception that nontenure-track faculty may not be recognized and rewarded to the same extent as tenure-track faculty—at least not in the short term. The bottom line is that the AACSB believes that a more equally weighted blend of academic and practitioner faculty will benefit our business schools and accounting students. While students will still learn about academic research-based theories of accounting and business, they’ll also learn more about current practices. Integrating practice- and theory-oriented faculty should also result in publications that are more useful to working accountants. The updated AACSB faculty qualification standards provide for an exciting, transformative landscape for business schools. Management accountants and other financial professionals now have a better chance than ever before to teach at AACSB-accredited institutions, enhance the quality of students’ education, and interface with academics. We encourage more alumni, advisory boards, and recruiters to assist business schools and accounting programs in implementing a more balanced mix of academic and professional faculty to sustain and improve the quality of business and accounting education throughout the United States and abroad. 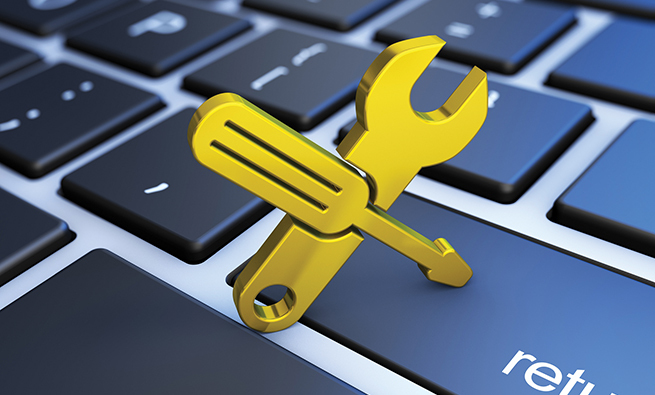 Note: The authors would like to acknowledge the helpful comments from Cindy Wyatt, CPA, CFE, CITP, CFF, the managing member of INSYTE CPAs, in the preparation of this article. Jenice Prather-Kinsey, CPA, CGMA, Ph.D., is a professor in the Department of Accounting and Finance, Collat School of Business, at the University of Alabama at Birmingham. Jenice, who is a member of IMA’s Birmingham Chapter, can be reached at (205) 934-8828 or pratherkinsey@uab.edu. Arline Savage, Ph.D., is a professor and chair of the Department of Accounting and Finance, Collat School of Business, at the University of Alabama at Birmingham. You can reach her at (205) 934-8825 or arlsav@uab.edu. Scott Boyar, Ph.D., is a professor in the Department of Management, Information Systems and Quantitative Methods, Collat School of Business, at the University of Alabama at Birmingham. Scott can be reached at (205) 975-5490 or slboyar@uab.edu. John Exline, CMA, CPA, is CFO at Clark Investment Group, a private real estate development and investment company based in Wichita, Kan. He is a member of IMA’s Wichita Chapter and the IMA Global Board of Directors. You can reach him at (316) 634-1112 or jexline@clarkinv.com. About time… Probably too late for me..